The seeds of fennel are used for their anti-inflammatory, deep-cleansing, detoxifying, revitalizing, antimicrobial and circulatory stimulant properties. The active constituents of fennel seed include: terpenes, fatty acids, protein, flavonoids, phenolcarboxylic acids and coumarins. Best for normal to dry and mature skin, fennel seed is used in facial steams, cleansers, soaps, anti-wrinkle creams and lotions. It also helps to calm unevenly colored or blotchy skin. A cool fennel seed tea compress is used to reduce puffiness on closed swollen eyes and as a tonic for chapped skin. Fennel is used in salves to heal bruises. Chewing a few fennel seeds after a meal helps freshen the breath. It is also an insect repellant. Fennel’s name comes from the Latin foeniculum, meaning “little hay”. The Roman historian Pliny recorded that when snakes shed their skins, they ate fennel to restore their sight (although he did not record how he made this observation). Several liquors are flavored with fennel, including aquavit, gin, absinthe and fennouillete. All the above-ground parts of the fennel plant are edible. Fennel “seeds” are actually whole fruits, the most aromatic seeds found in the center of the seed head. In seed, a bright green color indicates quality. The herb should be stored in a tightly closed container in a cool, dry place. Foeniculum vulgare and Anethum Foeniculum, Bari-Sanuf, Bitter Fennel, Carosella, Common Fennel, Fennel Oil, Fennel Seed, Finnochio, Florence Fennel, Foeniculi Antheroleum, Foeniculum Officinale, Foeniculum Capillaceum, Garden Fennel, Large Fennel, Sanuf, Shatapuspha, Sweet Fennel, Wild Fennel. Described as a sweet, floral top-middle note with an herbaceous spicy undertone, essential oil of fennel is energizing, stimulating, warming, and eases fear. It is used widely in perfumes and to scent haircare products. Essential oil of fennel is also often used in toothpastes and mouthwashes. The seeds of fennel are used for their anti-inflammatory, deep-cleansing, detoxifying, revitalizing, antimicrobial and circulatory stimulant properties. The active constituents of fennel seed include: terpenes, fatty acids, protein, flavonoids, phenolcarboxylic acids and coumarins. Best for normal to dry and mature skin, fennel seed is used in facial steams, cleansers, soaps, anti-wrinkle creams and lotions. It also helps to calm unevenly colored or blotchy skin. A cool fennel seed tea compress is used to reduce puffiness on closed swollen eyes and as a tonic for chapped skin. Fennel is used in salves to heal bruises. The essential oil contains anethole (50 to 80%), limonene (5%), fenchone (5%), estragole (methyl-chavicol), safrole, a-pinene (0.5%), camphene, b-pinene, b-myrcene and p-cymene. The seed also contains fiber and complex carbohydrates. Fennel is well known throughout the food industry which utilizes all parts of the plant. The ancient Greeks thought fennel conveyed long life, courage, and strength. Their name for fennel was marathrion from maraino, meaning “to grow thin”. Fennel’s ability to stave off hunger was employed during fasting days in Europe. Avoid in epilepsy, estrogen dependent cancers, and while pregnant. May cause skin irritation. Ferric Ferrocyanide (CI 77510): an inorganic mineral salt used to provide a rich blue color. Cosmetic-grade ferric ferrocyanide is approved for use on the eyes and face in the U.S., and on lips, eyes and face in the E.U. and Japan. Please note: Ferric ferrocyanide is not approved for use on the lips in the U.S.
Prussian blue is a dark blue pigment with the idealized formula Fe7(CN)18. Another name for the color Prussian blue is Berlin blue or, in painting, Parisian blue. Prussian blue was one of the first synthetic pigments. It is employed as a very fine colloidal dispersion, as the compound itself is not soluble in water. It is famously complex, owing to the presence of variable amounts of other ions and the sensitive dependence of its appearance on the size of the colloidal particles formed when it is made. The pigment is used in paints, and it is the traditional "blue" in blueprints. In medicine, Prussian blue is used as an antidote for certain kinds of heavy metal poisoning, e.g., by cesium and thallium. In particular it was used to absorb 137Cs+ from those poisoned in the Goiânia accident. Prussian Blue is orally administered. The therapy exploits Prussian Blue's ion exchange properties and high affinity for certain "soft" metal cations. Prussian blue lent its name to prussic acid (hydrogen cyanide), which was derived from it. In Germany, hydrogen cyanide is called Blausäure ("blue acid"), and Joseph Louis Gay-Lussac gave cyanide its name, from the Greek word κυανός (kyanos, "blue"), because of the color of Prussian blue. Despite the fact that it is prepared from cyanide salts, Prussian blue is nontoxic because the cyanide groups are tightly bound to Fe. Other polymeric cyanometalates are similarly stable with low toxicity. Prussian blue is a microcrystalline blue powder. It is insoluble, but the crystallites tend to form a colloid. Such colloids can pass through fine filters. Despite being one of the oldest known synthetic compounds, the composition of Prussian blue remained uncertain for many years. Vincent van Gogh's Starry Night uses Prussian and Cerulean blue pigments. The essence of frankincense is distilled from the resinous "tears" that the tree produces in order to cicatrize the small wounds on its trunk and branches made to ripen the precious substance. Probably for this reason frankincense has an incredible cicatrisation power on wounds and lesions of various kinds on human skin. It is also referred to as olibanum, which is derived from the Arabic al-luban (“the milk”), a reference to the milky sap tapped from the tree. Frankincense has been used in cosmetics since antiquity for wrinkles and skin infections. The active constituents of frankincense include: terpenes, mucilage and boswellic acids (named after the plant). Its properties for skin include: anti-aging, antiseptic, anti-wrinkle, rejuvenating, revitalizing, stimulating, vulnerary and warming. It is also good for stretch marks. Olibanum is described as a rich, oriental base note, with citrus, spice and incense undertones. Diffused in the air, frankincense possesses extraordinary antiseptic properties and is purifying as much for the spaces in which we occupy as for our minds. Additional properties for mind include: calming, energizing, fortifying, grounding, relaxing and stimulating. It helps to ease anxiety, depression, disappointment, fatigue, fear, grief, impatience, insecurity, loneliness, nervousness, panic attacks, stress and tension. Frankincense has a long history as incense. It was burned by the Egyptians and is used in many religious ceremonies. Traditionally it has also been used for skin ailments. 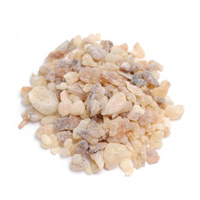 Frankincense has many other names that it is known as. Most commonly you will see it as frankincense, olibanum, or boswellia. A natural sugar used for moisture binding and to soften skin. Fructose, or fruit sugar, is a simple monosaccharide found in many plants, where it is often bonded to glucose to form the disaccharide sucrose. It is one of the three dietary monosaccharides, along with glucose and galactose, that are absorbed directly into the bloodstream during digestion. Fructose was discovered by French chemist Augustin-Pierre Dubrunfaut in 1847. The name "fructose" was coined in 1857 by the English chemist William Miller. Pure, dry fructose is a very sweet, white, odorless, crystalline solid and is the most water-soluble of all the sugars. From plant sources, fructose is found in honey, tree and vine fruits, flowers, berries, and most root vegetables. Commercially, fructose is frequently derived from sugar cane, sugar beets, and maize. Crystalline fructose is the monosaccharide, dried, ground, and of high purity. High-fructose corn syrup (HFCS) is a mixture of glucose and fructose as monosaccharides. Sucrose is a compound with one molecule of glucose covalently linked to one molecule of fructose. All forms of fructose, including fruits and juices, are commonly added to foods and drinks for palatability and taste enhancement, and for browning of some foods, such as baked goods.